The PCSX2 is a playstation 2 emulator! 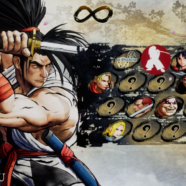 There were many classic fighting game titles available for this system and with a modified version of the emulator online play is possible through a P2P connection! King Of Fighter 2002: Unlimited Match Tougeki ver.